As noted in our Winter 2018 Investor Letter, following passage of the Tax Cut and Jobs Act, the reduction in corporate tax rates caused analysts to revise their earnings growth expectations higher to nearly 24% for 2018. Given a number of positives, further upside in equity markets was anticipated in 2018. As fate would have it, not only were equity returns weak, most asset class returns were negative. Data from Lipper showed the Money Market Fund average return was 1.52% in 2018. In other words, cash turned out to be king in 2018 as can be seen in the below table. 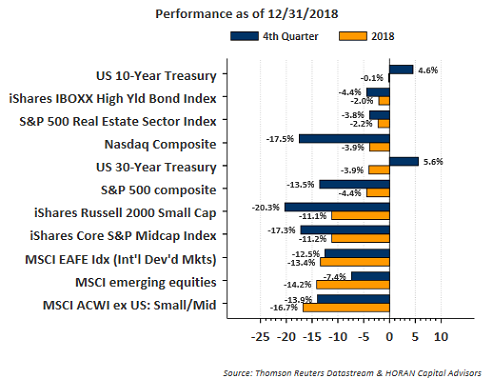 Despite solid fundamentals heading into the year, 2018 was extremely difficult. The uncertainties faced in 2018 will likely continue to overhang the markets in 2019. However, the events that drove markets lower last year proved to alleviate some of the concerns plaguing investors at the year’s start. For example, equity valuations have declined to a more attractive level. In January 2018, the S&P 500 had become the most expensive since 2004 on a forward P/E basis. The S&P 500 Index now trades at a price to earnings ratio of about 15 times which is in-line with its historical average. Growth and inflation have moderated while staying positive, alleviating concerns of an overheating economy and aggressive interest rate increases from a Hawkish Fed. Fed chair Jerome Powell recently remarked the Fed “will be patient” as they assess the prospects of further rate hikes in 2019. For additional insight into our views for the market and economy as 2019 begins, see our Investor Letter accessible at the below link.